... 1953, Dr. Judy Chu (right) was born in Los Angeles, California. (photo credit) After earning her B.A. in mathematics from UCLA and her Ph.D. in psychology from the California School of Professional Psychology, Chu taught psychology and eventually embarked on a political career, serving a quarter-century in positions including a school board, as a mayor, and as a state legislator. 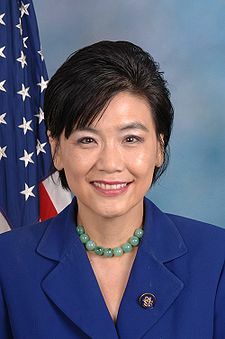 In July 2009, she was elected to fill a Los Angeles-area congressional seat vacated by Hilda Solis, now the U.S. Secretary of Labor; Chu thus became the 1st Chinese-American person to serve in Congress.She's a member of the House Judiciary Committee, serving on the Crime, Terrorism, and Homeland Security and the Intellectual Property, Competition, and the Internet subcommittees.